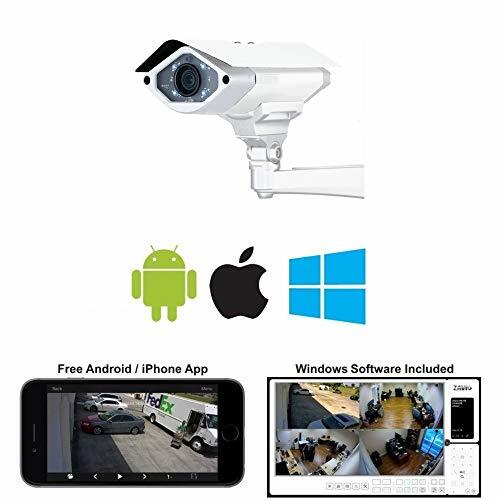 The Zavio B8520 is an IP bullet camera with a built-in LPR mode that is designed to operate in extreme outdoor weather conditions. The LPR mode (license plate recognition) of the camera can be enabled to capture plates from up to 40 feet away from the vehicles. This bullet camera features a motorized 3.6~10mm lens that can be remotely adjusted from the camera’s interface. It records in an HD resolution of 2560 x 1920 at 30 frames per second or 1920 x 1080 at 60 frames per second. In addition, it records using the H.265 video compression to save as much as 50% bandwidth and storage when compared to H.264. A few more features of the B8520 include (2) alarm inputs, (2) alarm outputs, a built-in Micro SD/SDHC/SDXC Card Slot, and two-way audio support for use with external audio devices. A 64 channel Windows recording software is included. HD Resolution Recording – The B8520 can record in 2560 x 1920 at up to 30 framer per second or 1920 x 1080 at up to 60 frames per second. 3.6~10mm Motorized Lens – Users can adjust the camera’s from angle of view from 33°~88° remotely from the camera’s web interface.